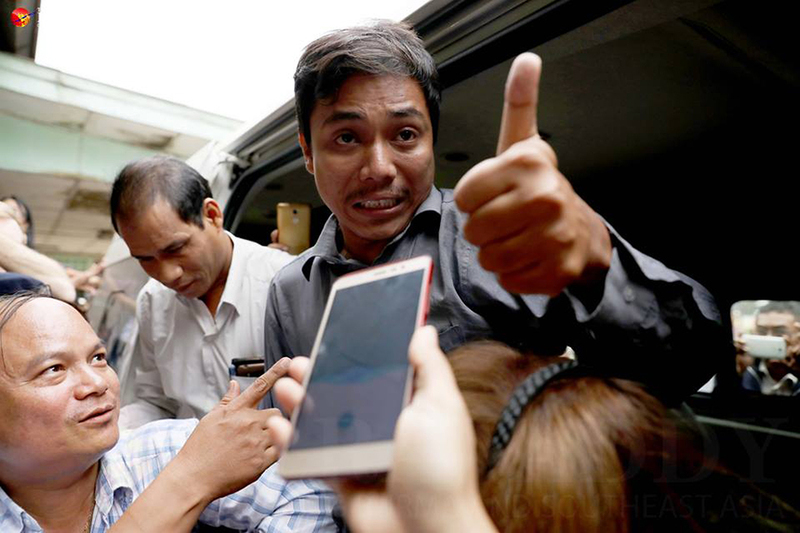 YANGON — “We have not made a mistake, neither violations of the media law nor ethics. As we have to face this situation, we will face it as best we can,” said Ko Wa Lone, a detained Reuters journalist who appeared at the Mingalardon Township court on Wednesday for the first time since his arrest on Dec. 12. Ko Wa Lone and his colleague Ko Kyaw Soe Oo were arrested for allegedly violating the colonial-era Official Secrets Act and questioned at the Aung Tha Pyay police interrogation center in Mayangone Township for 15 days. Ko Wa Lone told reporters that he was “fine” and faced no mistreatment during the detention. Two police officers who were also detained along with the reporters did not appear at the court on Wednesday. The pair saw their family members for the first time since their arrest. Ma Pan Ei Mon, the wife of Ko Wa Lone (aka) Thet Oo Maung, and Ma Nyo Nyo Aye, the sister of Ko Kyaw Soe Oo, were able to talk to their loved ones and followed the pair in a van when they left the court. Ma Nyo Nyo Aye told The Irrawaddy before meeting her brother that her family had been worried but that they didn’t know what to do. “I want to see my brother,” she said in a soft voice. The pair was taken to Insein prison after about 10 minutes at court, where police extended the remand. They will appear next on Jan. 10. The pair was charged under Section 3 of the Official Secrets Act, which carries a maximum prison sentence of 14 years. The two Reuters journalists had worked on coverage of a crisis in Rakhine, western Myanmar, where an estimated 655,000 Rohingya Muslims have fled from a fierce military crackdown on militants, following the Arakan Rohingya Salvation Army’s Aug. 25 attack on security outposts. In solidarity with the detained journalists, the reporters covering their case wore black t-shirts to express their support of them and of press freedom in Myanmar.